One World Trade Center One World Trade Center soars 1,776 feet, making it the Western Hemisphere’s tallest building and an iconic New York City landmark. With 104 stories of 3 million rentable square feet of space and 54 high speed destination dispatch passenger elevators, the project combined state-of-the-art safety systems, energy efficient technology and a cutting-edge combination of design and functionality. Arcadia Electrical was responsible for the installation of cabling, terminations and testing of infrastructure systems. During this project, Arcadia Electrical successfully navigated the Port Authority of New York and New Jersey’s specifications and requirements. 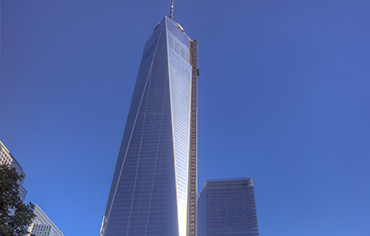 Arcadia Electrical was involved in the VSC that connects underground tunnels and feeds the entire 16-acre World Trade Center complex – linking the security checkpoint with the buildings that require vehicle services. Arcadia Electrical ran miles of Fiber optic cables, Cat 6 and multiplex cabling throughout the VSC complex for the highly sophisticated telecommunications and security system throughout the World Trade Center complex.